Jeffrey Gibson (Mississippi Band Choctaw/Cherokee), Like A Hammer, 2014. Elk hide, glass beads, artificial sinew, wool blanket, metal studs, steel, found pinewood block, and fur; 56 x 24 x 11 in. Collection of Tracy Richelle High and Roman Johnson. Courtesy of Marc Straus Gallery, New York. Image courtesy of Jeffrey Gibson Studio and Roberts Projects, Los Angeles, California. Photograph by Peter Mauney. ©Jeffrey Gibson. Jeffrey Gibson (Mississippi Band Choctaw/Cherokee), OUR FREEDOM IS WORTH MORE THAN OUR PAIN, 2017. Repurposed punching bags, glass beads, artificial sinew, acrylic felt, steel and brass; 114 x 71 x 42 in. Collection of Vicki and Kent Logan. Image courtesy of Jeffrey Gibson Studio and Roberts Projects, Los Angeles, California. Photograph by Peter Mauney. © Jeffrey Gibson. Jeffrey Gibson (Mississippi Band Choctaw/Cherokee), All Things Big and Small, 2016. Acrylic paint and graphite on canvas; 70 x 57.125 in. Collection of Lisa and Stuart Ginsberg. Image courtesy of Jeffrey Gibson Studio and Roberts Projects, Los Angeles, California. Photograph by Peter Mauney. © Jeffrey Gibson. Jeffrey Gibson (Mississippi Band Choctaw/Cherokee), CAN'T TAKE MY EYES OFF OF YOU, 2015. High fire glazed ceramic, repurposed tipi poles, wool, acrylic paint, wool blanket, glass beads, artificial sinew, copper jingles, and nylon fringe; 72 x 29 x 38 in. Collection of Vicki and Kent Logan. Image courtesy of Jeffrey Gibson Studio and Roberts Projects, Los Angeles, California. Photograph by Peter Mauney. © Jeffrey Gibson. Jeffrey Gibson: Like a Hammer—the first major museum exhibition of the artist’s work—chronicles a pivotal moment in Gibson’s career when his contemporary artistic practice converged with his Native American heritage. About 57 objects created from 2011 to the present are featured including wall hangings, beaded ‭punching bags, painted works on rawhide ‭and canvas, and video. The exhibition shows how Gibson draws upon his heritage and remixes his older works to create a visual vocabulary that explores his multi-faceted identity and the history of modernism. Gibson’s abstract works take inspiration from his Choctaw and Cherokee heritage, pan-Native American visual culture, alternative subcultures, and the artist’s experiences living abroad as well as popular culture. Striking patterned and textured works incorporate text from poems, Gibson’s own voice, and song lyrics such as Stevie Wonder’s Sir Duke. Gibson frequently explores colonialism and the post-colonial mindset, reflecting on how American Indian experiences parallel other civil-rights movements. His work also revolves around universal themes of love, community, strength, vulnerability, and survival. Through this exhibition, catalog, and related programming, visitors will be able to gain an enhanced understanding of Gibson’s distinctive and complex creative practice, as well as how it has evolved from series to series. The exhibition catalog is available in The Shops and online. It is the first to comprehensively detail Gibson’s career and body of work. The exhibition is organized by the DAM and curated by John Lukavic, curator of Native arts. Following its run at the DAM, this exhibition will travel to the Mississippi Museum of Art (September 8, 2018–January 20, 2019), the Seattle Art Museum (February 28–May 12, 2019), and to its final destination at the Madison Museum of Contemporary Art (June 7–September 14, 2019). Incluida en la entrada general Comprar entradas generales por Internet. Jeffrey Gibson: Like a Hammer (Jeffrey Gibson: como un martillo) es la primera exposición de gran envergadura del artista en el museo y es una crónica del momento fundamental de la carrera de Gibson cuando su tradición artística contemporánea se encontró con su ascendencia indígena. Se exhiben cerca de 65 objetos creados de 2011 hasta el día de hoy, entre los que podemos apreciar tapices, sacos de boxeo decorados con cuentas, pinturas sobre cuero crudo y lienzo y videos. La exposición busca mostrar cómo Gibson apela a su legado cultural y versiona sus obras anteriores para crear un vocabulario visual que explora su identidad multifacética así como la historia del modernismo. Sus obras abstractas se inspiran en su ascendencia choctaw y cheroqui, la cultura visual de los indígenas panamericanos, las subculturas alternativas y las experiencias del artista durante sus viajes en el extranjero, así como la cultura popular. Los trabajos de Gibson, con atractivos diseños y texturas, incorporan textos de poemas, la voz del artista y letras de canciones, como “Sir Duke”, de Stevie Wonder. Gibson a menudo explora la mentalidad imperante durante las épocas del colonialismo y poscolonialismo para reflexionar sobre las experiencias de los indígenas norteamericanos y cómo sus vivencias se asemejan a las de otros movimientos de lucha por los derechos civiles. Su trabajo también está relacionado con temas universales, como el amor, la comunidad, la fortaleza, la vulnerabilidad y la supervivencia. A través del catálogo de la exposición y de programación afín, los visitantes podrán entender mejor el ejercicio creativo de Gibson, peculiar y complejo, así como su evolución de serie a serie. 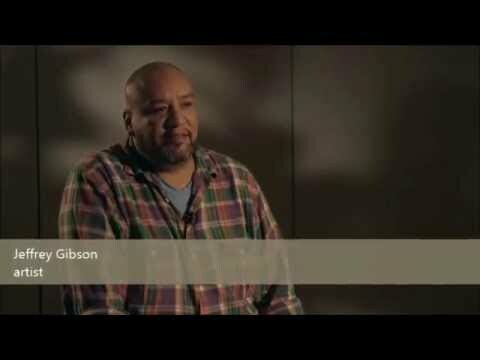 El video que se muestra aquí se hizo cuando Gibson fue artista indígena residente del DAM en 2014. Las tiendas del DAM ofrecerán un catálogo de la exposición a partir de mayo de 2018, el cual también podrá adquirirse por internet y será el primero en relatar la carrera completa y las obras de Gibson en detalle. La exposición está organizada por el DAM y está a cargo de John Lukavic, curador de artes indígenas. Después del DAM, esta exposición se exhibirá en el Mississippi Museum of Art (del 8 de septiembre de 2018 al 20 de enero de 2019), el Seattle Art Museum (del 28 de febrero al 12 de mayo de 2019) y en su destino final en el Madison Museum of Contemporary Art (del 7 de junio al 14 de septiembre de 2019). Jeffrey Gibson: Like a Hammer está organizada por el Denver Art Museum. Recibe el generoso apoyo de Vicki y Kent Logan, del National Endowment for the Arts, del U.S. Bank, de los donantes para la campaña benéfica Annual Fund Leadership Campaign y de los ciudadanos que brindan su apoyo al Distrito de Organizaciones Científicas y Culturales (SCFD, por sus siglas en inglés). Apoyo promocional proporcionado por 5280 Magazine, CBS4, Comcast Spotlight y The Denver Post. 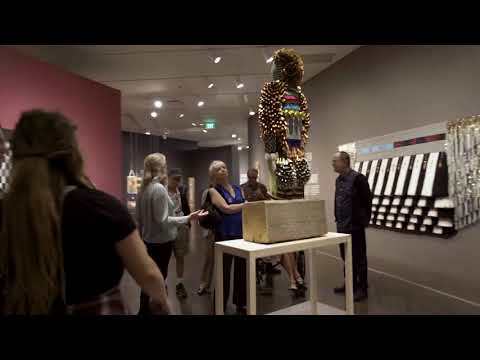 Jeffrey Gibson: Like a Hammer is organized by the Denver Art Museum. It is presented with the generous support of Vicki and Kent Logan, the National Endowment for the Arts, U.S. Bank, the donors to the Annual Fund Leadership Campaign, and the citizens who support the Scientific and Cultural Facilities District (SCFD). Promotional support is provided by 5280 Magazine, CBS4, Comcast Spotlight, and The Denver Post.